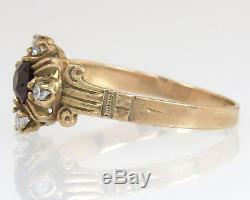 40ct Genuine Diamond & Garnet Victorian Ring 1.5g. 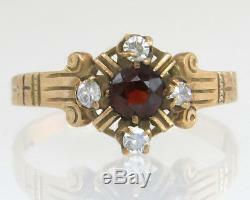 Featured for sale here is an estate antique Victorian 10K solid gold genuine diamond & garnet ring! 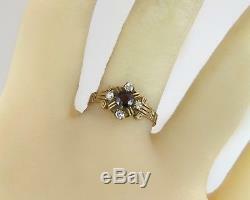 25ct garnet is prong set in the center of four. 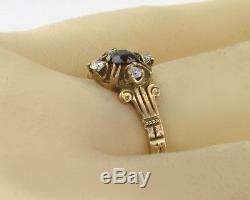 A wonderful display of gemstones with classic Victorian detailing throughout the gold setting! This piece is in great shape! The diamonds are in excellent shape while the garnet shows some signs of wear. Band of the ring has a small chip out of the gold. Solid 10K gold; some original patina present on the gold. 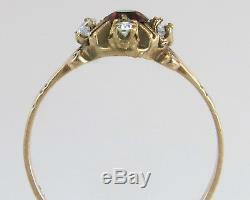 Ring measures 9 mm wide at the front and rises 3.7 mm above the finger. Victorian detail throughout make this a piece that will be treasured now and for generations to come! The approximate retail price we state is not an appraisal; we do not provide appraisal prices on the items we sell. You are the only person who can determine the worth of the piece. The item "Antique Estate 10K Gold. 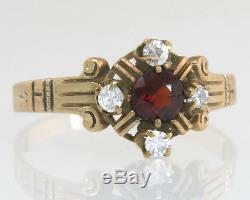 40ct Genuine Diamond & Garnet Victorian Ring 1.5g" is in sale since Tuesday, April 11, 2017.